Underwater photography like never before. Happy Holidays!!! We wish everyone all the diving in the world you could wish for, alone or with your family or friends. Remember, under the water we are all friends! Now let’s talk about holiday presents. Don’t you love it when you get to unwrap those presents that you have been staring at under the tree for the past month? Wondering what could possibly fit in such a tiny box. Well, I bet that at least a few of you had one of those little boxes under the tree and I think it is safe to say that a few of you received this amazing gadget: a GoPro camera. 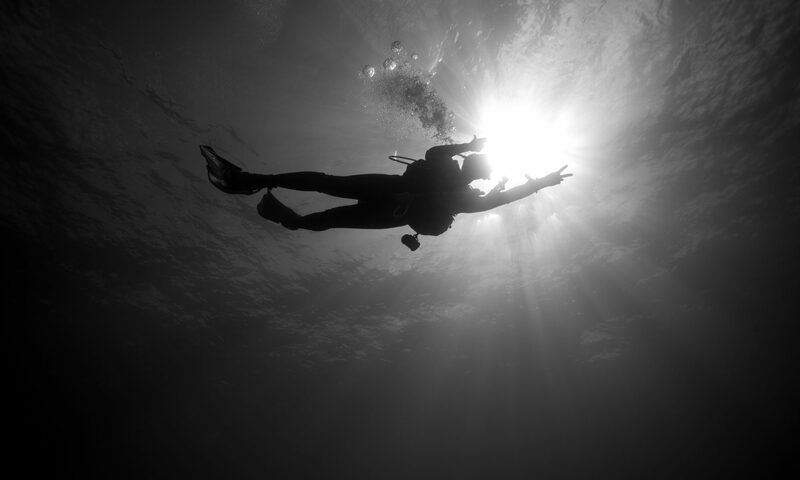 Underwater photography has been on the rise for a couple of years now. From disposable underwater cameras, to $$$ housings for DSLR cameras, there are so many options. We saw an increase of interest here in the BVI and decided to start renting out digital underwater cameras a couple of years ago. We had a basic Sony or Canon point-and-shoot camera with Ikelite housing. For around $350 you would be good to go. A good few people even rented our cameras to capture their underwater adventures with their friends and families. We have since hired 2 amazing underwater photographers who came with their own big and expensive rig. A canon II Mark D, add Ikelite housing to it and you get something looking like this; Very big, very expensive, but these amazingly talented guys make it look so easy and take some unparalleled shots under the water. These guys still do fantastic; our digital underwater camera rental business however, took a plunge. The reason for that; the GoPro. We can’t blame anyone for this newest gadget being so absolutely amazing. We even caved in and got one of them as the footage on them is absolutely fantastic. You take them diving, maybe add a red filter on them to enhance the colors, use their easy editing software and you have your own amazing video or photos allowing you to relive your great dive adventures. Before I let you all return excitingly to play with your new GoPro or enjoy any presents you may have received, I would just like to finish this blog with one heck of a GoPro story. Back in August, Peter and his brother did a dive with us on the wreck of the Rhone, here in the BVI. During their dive at 80ft, unfortunately somehow the GoPro became unattached from the attachment they were using. Once they realized the GoPro was missing, it was too late. They could just about watch the GoPro reach the surface and float away. Being at 80ft, there was no way they could make it up fast and safe enough to catch the GoPro. So they continued the dive and as soon as all the divers were back onboard the boat, we headed out spending our surface interval searching the surface for the GoPro, to no avail. With slight sadness in their hearts we did the second dive and empty handed, but with great memories in our heads, returned back to the dock. At the beginning of December, Kay, one of our instructors, noticed a post on the BVI Community Page on Facebook. Someone had found a GoPro on South Caicos beach in Turks and Caicos. The footage showed Peter and his family here in the BVI at Bitter End Yacht Club and them diving the wreck of the Rhone before it floated away. So we contacted Peter, who got in touch with the person who found the GoPro and Peter and his GoPro will be reunited after all. What a great story about an amazing underwater camera and proof that there are amazingly honest and helpful people out there. What a story to start another amazing year…Happy Holidays again everyone and here is to a fantastic 2016!